Did you ever wonder why successful entrepreneurs always seem to accomplish ‘magical’ results, even in uncertain times, while others struggle on a daily basis? What do they do differently? What can managers really learn from successful entrepreneurs? Corporate Effectuation brings a scientifically proven method called ‘Effectuation’ to corporate organizations. Effectuation consists of 5 principles that help managers cope with uncertainty and unpredictability. The five principles are proven in a corporate context in collaboration with 17 path banding co-authors. In this book, valuable case studies are presented such as Philips, RWE Essent, Rabobank, KVD, University Hospital of Maastricht and De Beukelaar Groep. A changing world requires strategic flexibility. Corporate Effectuation offers a new view of ‘corporate entrepreneurship’ and illuminates insight into new tools for corporations such as Business Modeling and Reframing. 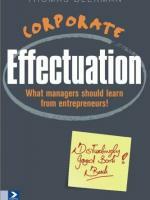 After reading Corporate Effectuation there is no longer reason to be a ‘smart-follower’. Apply these new insights and you too can be a ‘smart-creator’.